SIMILAR QUALITY AS INTEX ULTRAFRAME POOLS, WITH A SUPERIOR SKIMMER PLUS™ SYSTEM THAT KEEPS THIS POOL CLEAN! These quick-assembling, affordable pools bring family fun and relaxation to any backyard. ProSeries™ pools are up to 80% stronger than other frame pools, so they will withstand rigorous use. They are constructed of super durable heavy gauge PVC composite material & reinforced with an inner layer of polyester mesh for super strength (similar to river raft material). In addition to superior strength, ProSeries ™ pools feature our SKIMMER PLUS™ filtration system. Unlike other frame pools, this pool has a functioning surface skimmer that keeps your pool free from leaves & bugs. The integral cartridge and skimmer basket are easy to remove & clean. 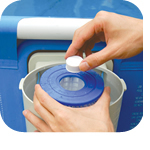 Skimmer Plus™ can accommodate 1” chlorine tablets that are added in the cartridge to keep your water clean and save. ProSeries frame pools are the ultimate in affordable swimming pools. They come complete with: Pool, Skimmer Plus™ pump & filter system, ladder with safety barrier, pool cover, and maintenance kit. SkimmerPlus™ Filtration System attaches to sidewall for easy maintenance. Provides full surface skimming unlike Intex® Pools. 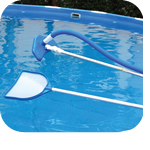 Powerful surface skimmer removes leaves, bugs & debris from pool. Removable built-in skimmer basket for easy cleaning. Our skimmer unit catches debris before it sinks to pool bottom. Patented cartridge filter with built-in chlorinator accepts 1” trichlor tablets. Comes with vac hose, leaf skimmer, telepole and vacuum head for easy maintenance. Ships via truckline. Please include a valid phone number with order. Buyer will need to inspect and sign on delivery.